As part of his visit to Myanmar, Minister Dion held a conversation on federalism with Members of Parliament from across the country. The event was organized by the Forum and Bayda Institute, one of the Forum’s local partner organizations. All Members of Parliament had participated in the Forum’s federalism training program. During the meeting, the Minister shared some of the lessons Canada has learned and noted that both Canada and Myanmar were stronger because of cultural diversity. One MP commented, “Federalism is the answer to our country’s problems.” All participants pledged to cooperate with relevant stakeholders in ensuring equitable power sharing. 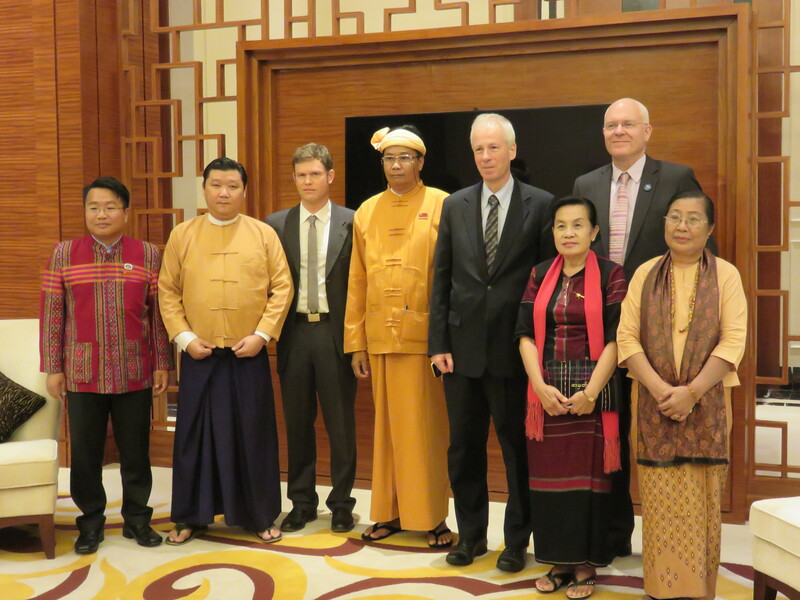 With the support of the Government of Canada, the Forum of Federations has been active in Myanmar since 2012, running more than 30 federalism trainings for a variety of stakeholders, including MPs, government officials, EAOs and CSOs. Key to the success of the organization’s initiatives in the country is the Forum’s even handed engagement with the ethnic armed groups/parties, the NLD (70 of whose candidates have participated in Forum training), and the military-backed USDP. The Forum’s new project which runs from 2016-2018 responds to the political process in Myanmar, which is currently shifting from military dictatorship and ethnic-based internal conflict to democratic decentralized governance and accommodation of Myanmar’s ethnic groups. There is now a consensus among major stakeholders on the need for a more inclusive decentralized political system. However, challenges related to the realization of federalism persist, including: constraints under the current constitution; limited understanding of federalism among newly elected MPs, government officials and the general public; inadequate knowledge about the experience of other countries with federal systems; limited awareness of the importance of greater engagement of women in the political process; and a lack of practical tools and approaches to advance related reforms. Building a federal system in Myanmar also touches on sensitive issues such as constitutional reform and how natural resources should be shared. In general, the capacity to address governance questions remain low and misconceptions about political concepts such as federalism remain prevalent. The project will increase the awareness and knowledge of political stakeholders of federal governance issues and develop administrative capacity to enable stakeholders to make informed decisions about the implementation of democratic and federal principles. It consists of the following interrelated components: intensive training for key stakeholders (including members of parliament at Union and State level, government officials, political party leaders, media and civil society representatives); capacity building support to government officials at the federal, state/regional and township levels; an outreach program for civil society; and the development of training/educational material. A core indigenous capacity for training on federalism will also be developed. The project targets several groups of beneficiaries. An estimated total of 740 federal and state level government officials will be trained to provide them with the necessary knowledge and skills to take on the new administrative tasks under a more decentralized federal system. An additional 1,280 officials, including newly elected political representatives, will also receive training on federalism, including how to promote gender equality under a federal system. Awareness-raising outreach programs on key aspects of federalism will benefit 19,500 people in positions of influence capable of shaping views at the community level (e.g. community leaders, local government officials, members of civil society, journalists, etc.) in the majority of the country’s 325 townships.